Leckine Burial Ground is a private, walled burial ground for the MacLaren clan. The burial ground lies on the N side of Loch Earn, just to the E of Lochearnhead village, on the hillside above the shore of the loch. It is today surrounded by the settlement of Earnknowe, with the disused Lochearnhead to Crieff railway immediately to the N. There is documentary evidence of the existence of Leckine burial ground in the late 17th century, whilst the date of the oldest identifiable stone today is 1773. The last MacLaren with the right to interment within the ground was buried here in 1993. Today the burial ground is preserved and maintained by the residents of Earnknowe. The burial ground has associations with one of the most prominent clans of the area and is preserved in outstanding condition. The burial ground is surrounded on all four sides by dry stane dyking, entered from the S side through a gateway formed by 2 tall, square plan, shaped rubble piers, which are probably mid 19th century. The wallhead of the S wall is level, and appears to have been repaired at the same time as the gateway was built. The walls to the sides and rear are in a poorer state of repair, and are less carefully coursed than the S wall, suggesting they may not have been repaired when the work to the S was carried out. In the wall to the W, a long wooden beam is built into the stonework, in roughly the same position as an old gate marked on the mid 19th century map of the burial ground. It is unclear what this beam was used for, were it to be a lintel it suggests dramatic changes in the ground levels. There are 13 standing gravestones, with numerous lying stones both marked and unmarked. 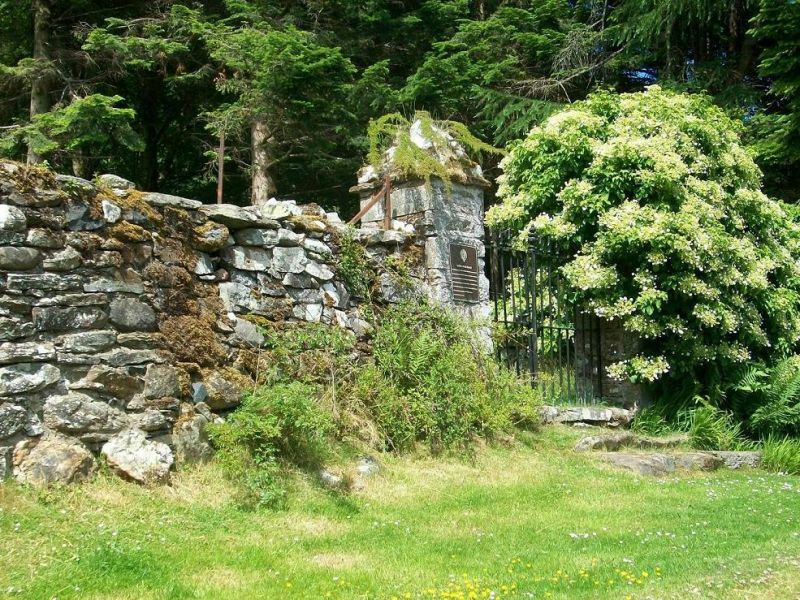 The burial ground at Leckine is an ancient site that was the private cemetery of the local MacLaren of Ardveich clan, who have lived and farmed in and around the Loch Earn area for centuries. The farm of Ardveich lies to the E of Leckine, and was occupied by the MacLarens for around 7 centuries, until the late 19th century. The lands of Ardveich were fertile and profitable farmlands, encompassing much of the N side of Loch Earn, between what is now Lochearnhead and St Fillans. The burial ground is said to have been established when the body of a Clan Chief, who had died at Ardveich, was held up at Leckine by a storm, en-route to the burial ground at Killin. The chief was later buried at Leckine, and later clan members followed suit. There is no documentary evidence to support this, which came word-of-mouth from Miss Margaret McLaren, who was the last member of the McLaren Clan to be buried at Leckine in 1993. A document within the papers of the Earl of Breadalbane in the National Archives of Scotland is a letter to the Earl asking permission to repair the burial ground, which is described as having been, 'constantly used for that purpose for 100 years back and upwards'. A map of the burial ground, thought to date from the mid 1850s, also shows the subdivision of the ground between different strands of the Clan, and the names of some who were buried there. Within the burial ground is the grave of Donald MacLaren, the banker, wool merchant and local businessman who formed the MacLaren High School and was one of the highest employers and most influential men in the area in the early 18th century. The grave of a local builder, William Angus from Auchraw, is also found within the burial ground. Whilst not of the MacLaren Clan, Angus repaired walls enclosing the burial ground and built the present gateway on the S wall, in exchange for a burial plot for himself when he died.